Andy Collins Beatty Ave, Roath Cardiff. To enable us to assess a cavity wall and to make a reasonable judgement as to the way it is behaving and is likely to behave, we have to think about a number of factors. Briefly these are load, wall material and wall geometry. Although to start with we shall look at these individually, in reality we have to assess them in combination when we come to deal with practical problems. Before we look at these structural matters, I will outline the reasons for the widespread use of cavity wall ties today. This form of construction started to come into use during the Victorian times, as an improvement to earlier solid type constructions. As we are all aware with solid construction penetrating damp is likely to occur. However the cavity wall by providing a complete separation between the inner and outer leaves or skins of the wall eliminates the passage of rainwater through the wall. In the early 1900’s this was the main reason for switching to cavity wall construction. When walls have collapsed, most of the failures have been a result of wind loads, particulary during gales. When wind blows around a building, there is an aerofoil effect and considerable disturbance to the flow of the wind occurs at corners and edges. It is also worth mentioning that when the structure was built it is likely that either two types of cavity wall tie was used. The butterfly type tie or the fish tail tie. These ties over time will eventually corrode and obviously weaken the structure. 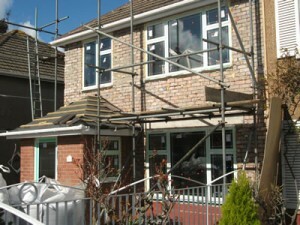 A borescope type inspection will always confirm the condition of the existing cavity wall ties. 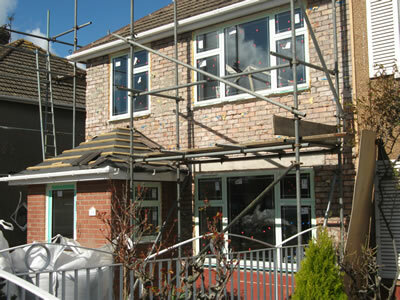 When corrosion is identified it is normnally recommended new cavity wall ties are installed to an agreed specification. The two images attached (coming soon) are of a property in Cardiff where new stainless steel wall ties have been installed and the walls rendered and finished to a reasonable standard.